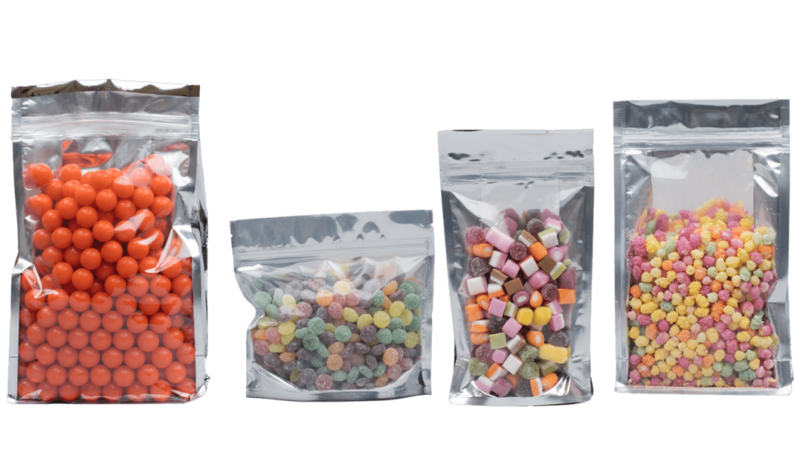 Our chrome pouches look great with colourful products and are sure to make your products stand out. We currently stock square bottom pouches, sachets and stand up pouches in this range. Please enquire for further details. How will chrome pouches help your products stand out? Chrome pouches are a fantastic flexible packaging solution if you need an extra protective layer to provide a moisture barrier and keep your products fresh for longer. Made from high barrier materials such as laminated aluminium and PET, these pouches can withstand high autoclaving temperatures, which means they are the ideal packaging solution if you manufacture microwavable foods. What products can be packaged in a chrome pouch? In addition to being incredibly well suited for human and pet foods where the freshness of the products is of the upmost importance, chrome pouches are also great as fancy sweets packaging (especially for the Christmas holidays). Choosing a windowed chrome pouch, ensures your colourful products will look even more stunning and are sure to stand out in the crowded marketplace. The health food industry is another area where the demand for foil bags has grown in recent years. Whether it’s protein powder, cocoa powder or wheatgrass powder you are looking to package, chrome pouches are the best solution available, thanks to their contamination-proof and waterproof qualities. The high barrier properties of chrome pouches also comes in handy for medical companies and laboratories that need a way to ensure their devices and medical samples remain safe during transportation. A variety of pharmaceutical products and medical accessories (such as blood sample bottles, wound care, tubing sets, etc.) can be packaged in protective foil bags. What are the benefits of chrome pouches? Chrome pouches, as a form of foil packaging, gain their popularity across a number of different industries, largely due to their extra layer of protection that helps extend the shelf-life of products. Their high barrier properties ensure the contents are protected from bacterial contamination, as well as moisture, oxygen and UV light. What’s more, chrome pouches are incredibly easy to transport and store due to the fact that they are both lightweight and durable. Foil bags also allow for easy opening and resealing, which is a great selling point for the customer, especially if your products are not single-use. The customisation options for chrome pouches are also extensive. Whether you choose a window pouch to showcase colourful, beautifully presented products on the retail shelf, or opt for a high-quality design printed on your foil packaging, you are sure to catch the eye of customers. There are also a number of formats you can choose for your chrome pouches, from stand up pouches and sachets to square bottom pouches.